For a foodie, if a friend drops into NCR, and is on expense account, and happens to be staying in a hotel known for its restaurants, the urge to meet such a friend becomes really strong. So when one such buddy called me and informed me that he was staying at the Hyatt, of course I invited myself over to China Kitchen, the much hyped up Chinese restaurant at the Hyatt. So I landed up at the restaurant at the appointed hour. The restaurant has an open kitchen that is encountered immediately on entering the restaurant, private dining rooms, a wine wall, and a dining area with ample natural light and greenery. We started with Shanghai chicken dumpling (Rs 528), also called soupy dim sums. One eats and drinks these dim sums by putting the whole dim sum in your mouth and enjoying the soup that floods your palate. It is a great experience. Next is the dish the restaurant is most famous for - Beijing style roasted duck (Rs 3888; full bird) with freshly made roti like pancakes and usual condiments. Traditionally called Peking Duck, it is carved at the table and served with its glorious skin on. The chef also fixes the pancake rolls with the duck meat, spring onion, cucumber and sweet bean sauce with pancakes rolled around the fillings. It is an OMG moment with a myriad textures and tastes pampering the palate. In the main course, sizzling sliced lamb chilli with ginger, red onion, coriander and cumin (Rs 1388) has a familiar desi taste that I enjoy with steamed northern rice (Rs 298). Crispy seabass fillet with ginger soy sauce (Rs 2088) is greatly enjoyable too. 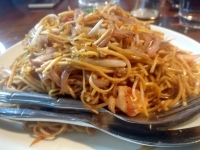 Spicy fried noodles with seafood (Rs 928) is the only average dish among the lot. So go find a friend on expense account who is willing to treat you. Or win a lottery. Or steal money from your younger brother’s piggy bank. Just have the Peking duck here. It is a dish you are likely to remember for a long time.